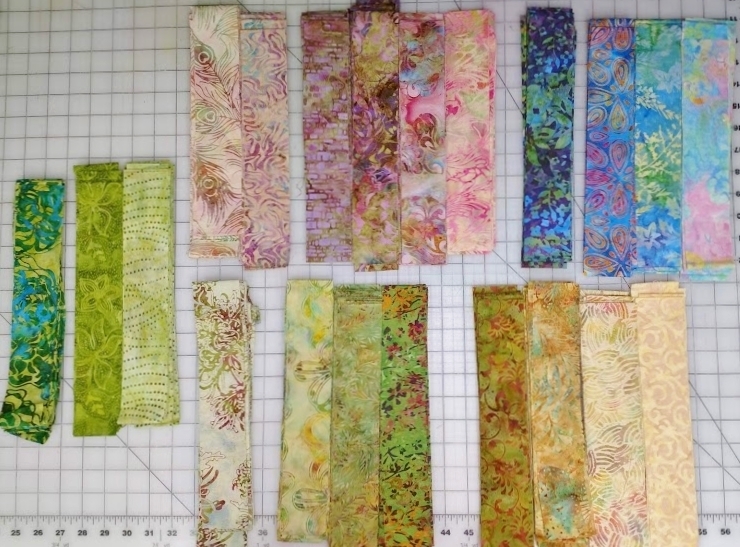 This is the ninth in a series of sew/quilt-along posts about making a bargello quilt. The quilt top is complete, and I’m considering my options for machine quilting the quilt top, batting, and backing together. 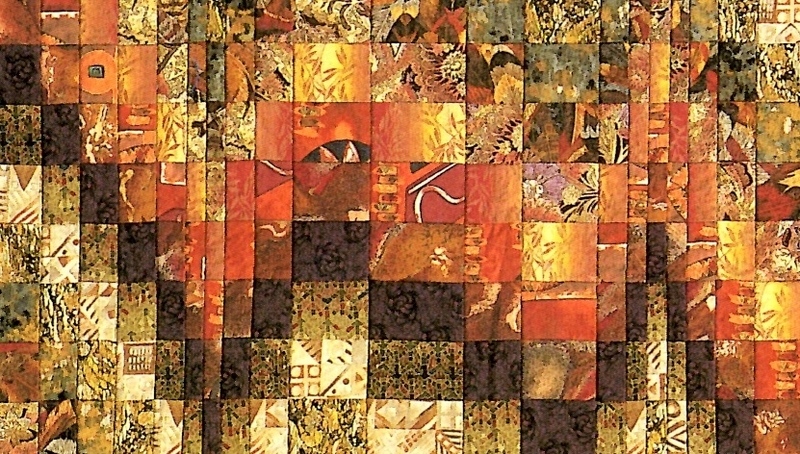 There are no rules about how best to quilt a bargello quilt, only preferences. Sometimes I feel that adding a lot of free-motion quilting might distract from the power and clarity of the design. 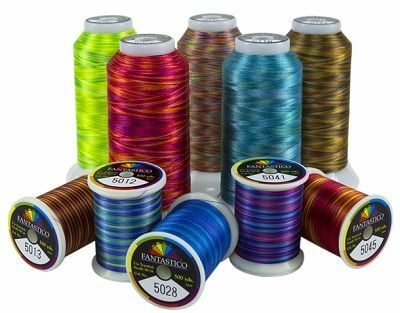 In those cases, I usually opt for clear MonoPoly thread in my needle and a walking foot (or even-feed foot) on my machine and hide the stitching “in the ditch” between the vertical rows. Fire on the Savannah from Colorwash Bargello Quilts is a good example of this – you can’t see the quilting on the front of the quilt unless you examine it extremely closely. 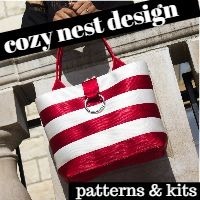 Another “in the ditch” alternative is to stair-step the quilting, following the design line. Close-up of the backside of a version of Cascade from Colorwash Bargello Quilts made by Sandy Harvey. Note the “stair-step” quilting along every third fabric in the vertical rows. 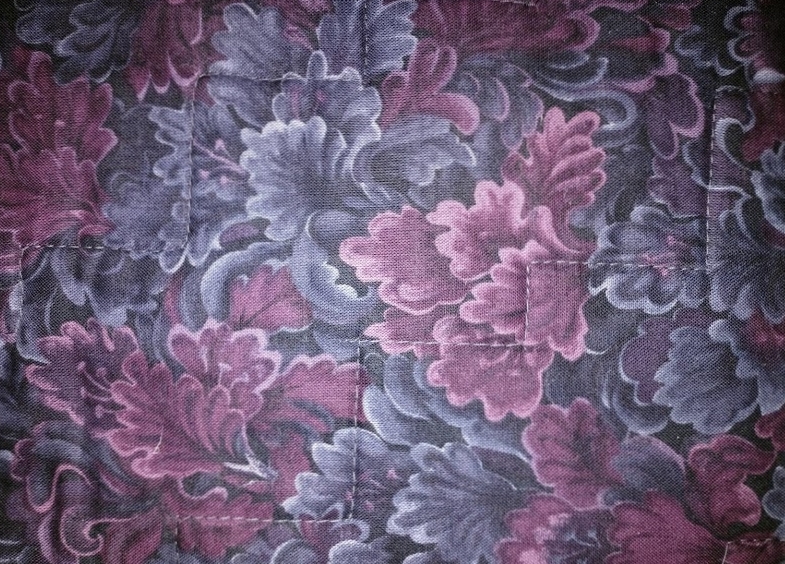 This stitching is hidden “in the ditch” on the front of the quilt. 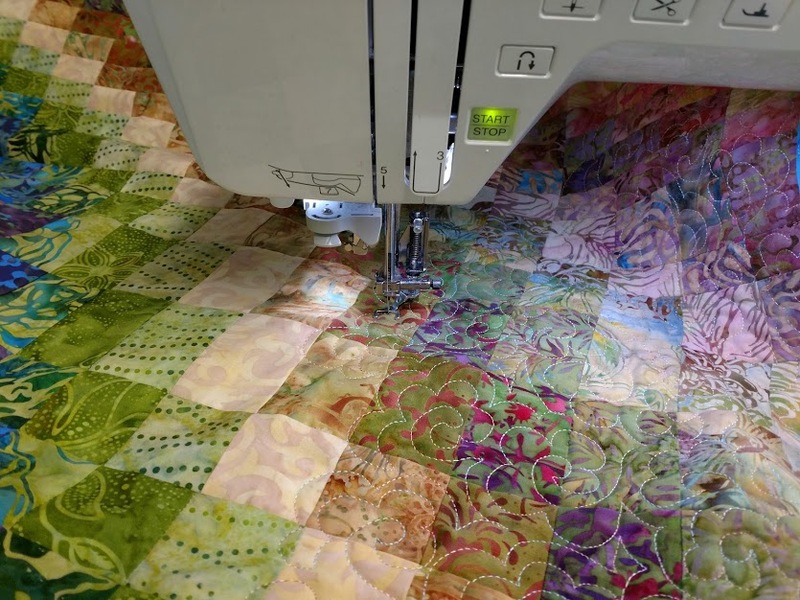 At other times, I deliberately use lots of free-motion quilting with highly visible thread (and a free-motion foot) to add an additional design element to the quilt. 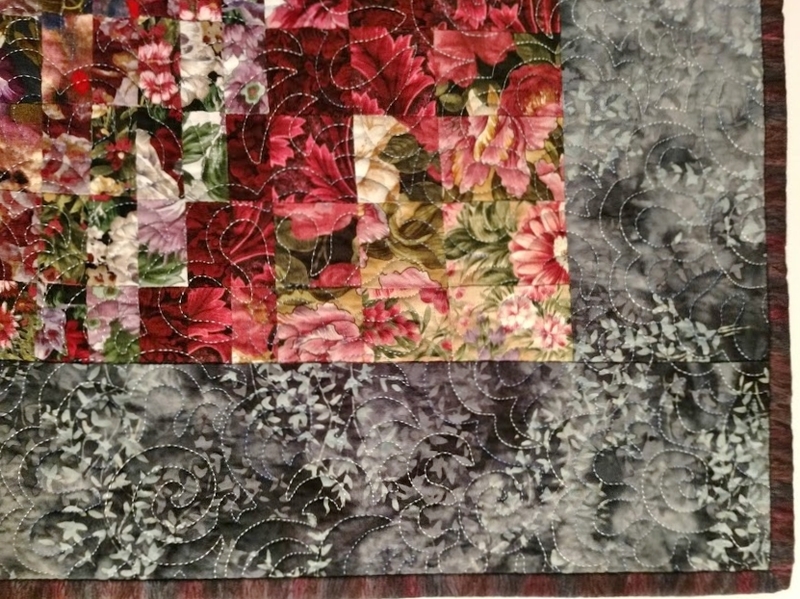 You may not notice the quilting from a distance, but it can be a fun surprise when you get up close! 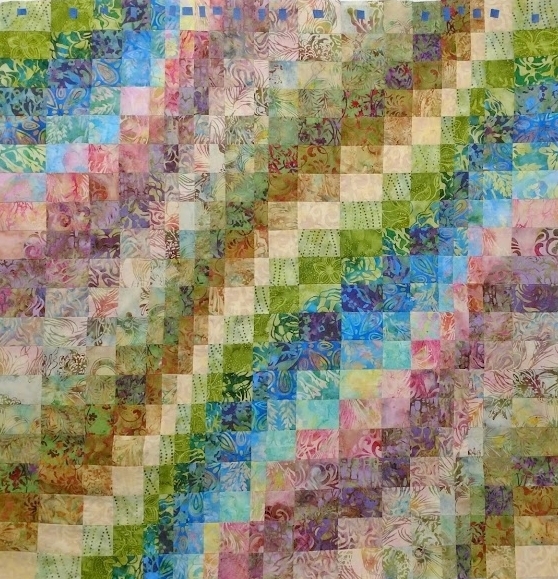 I also like to use the color of the thread as an additional unifying element in the quilt – the subtle sheen or veil of color it creates across the surface of the quilt can help reinforce a cohesive impression of the design as a unified whole rather than emphasizing individual colors or pieces of fabric. 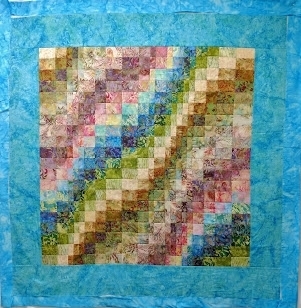 This is the eighth in a series of sew/quilt-along posts about making a bargello quilt. I’ve picked out my border and am ready to sew it on. 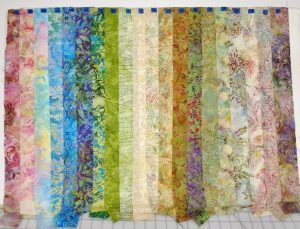 When I first started quilting many, many years ago, I would just lay my border strip across the end of the quilt, sew it on, and then cut off any extra border fabric that extended past the edge of the quilt. 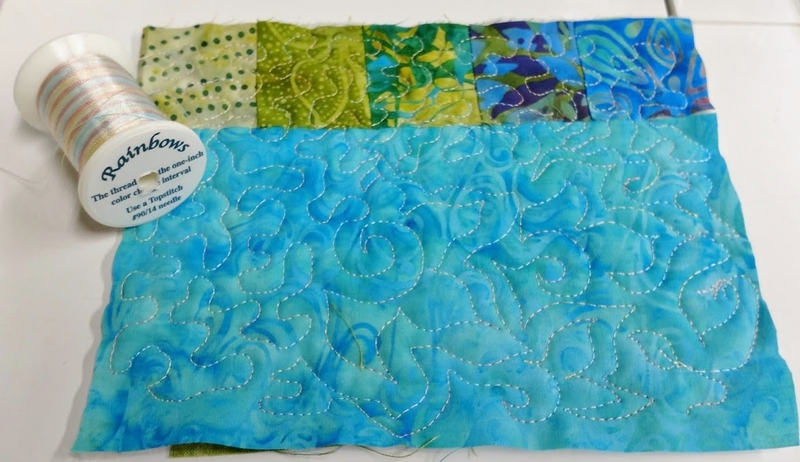 Sometimes this method seemed to work just fine; but other times, I would find myself grappling with quilt edges that were bowed instead of straight, wavy edges, or even little “volcanoes” or bulging areas within the quilt. 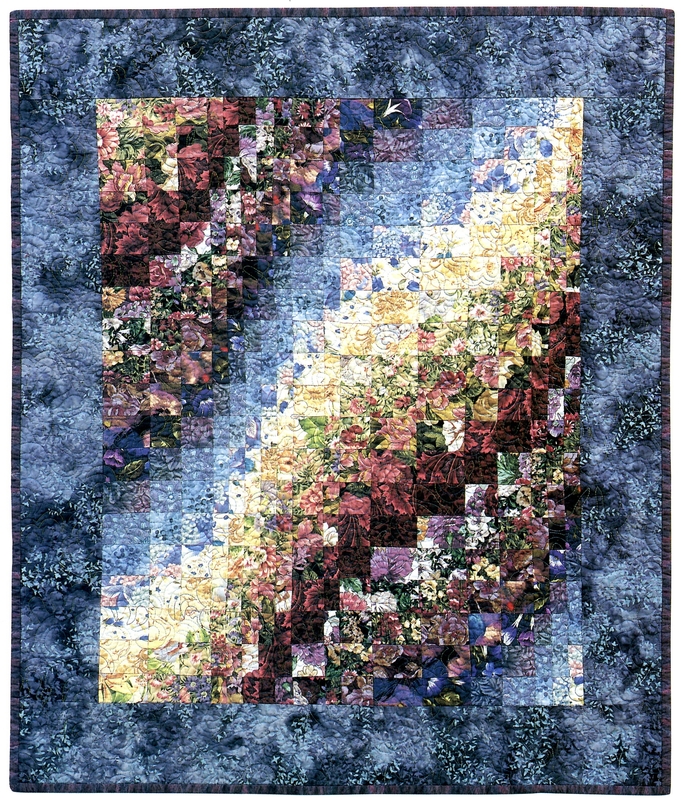 BUT if the discrepancy between the center of the quilt and the outer edge of the quilt is more than 1/4″, I recommend strategically trimming the quilt top or “squaring it up” before proceeding with the borders! 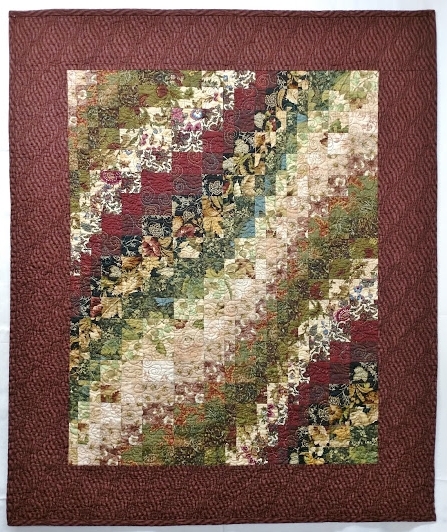 This is the seventh in a series of sew/quilt-along posts about making a bargello quilt. 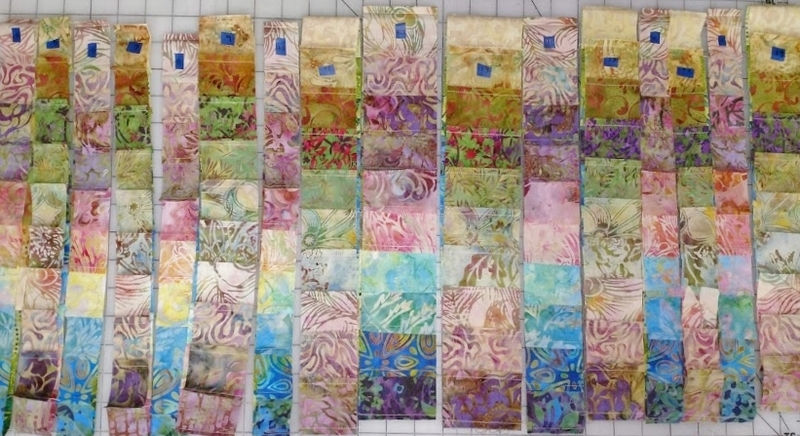 I am following the Cascade pattern from Colorwash Bargello Quilts. The body of the quilt top is complete, and now it is time for the border. 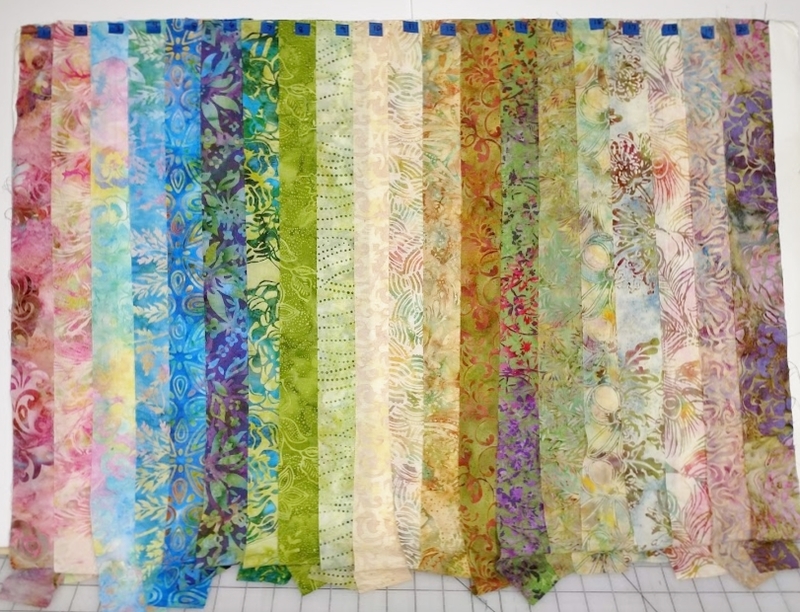 When I teach quilting classes or workshops, I usually caution class participants to wait, if possible, to make their final choice of border fabric until the interior of the quilt has been completed. This is because the sum can be much more than its parts! The way the colors, values, and visual textures of the fabrics interact with each other, as well as with the border fabric, can produce significantly different results from what you might anticipate. 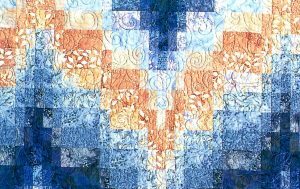 Furthermore, like any scrap quilt (or multi-fabric quilt), a bargello quilt can often be made to read as a “blue” or “brown” or “green” quilt simply by adding a border of that color. I find it helpful to lay the quilt top out on top of any fabric I am considering for a border so that I can see the border fabric on most or all of at least 2 sides of the quilt top. 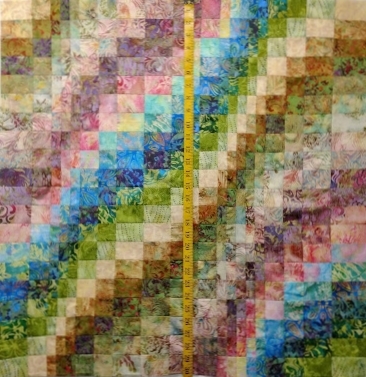 This is the fifth in a series of sew/quilt-along posts about making a bargello quilt. Now that my loops are all cut from the strip-pieced tubes (see previous post), I’m ready to open the loops up and lay out the bargello segments that form the vertical rows. This is exciting, as it will be the first chance to see what the finished quilt will look like. I start by laying all the loops on my worktable in order. 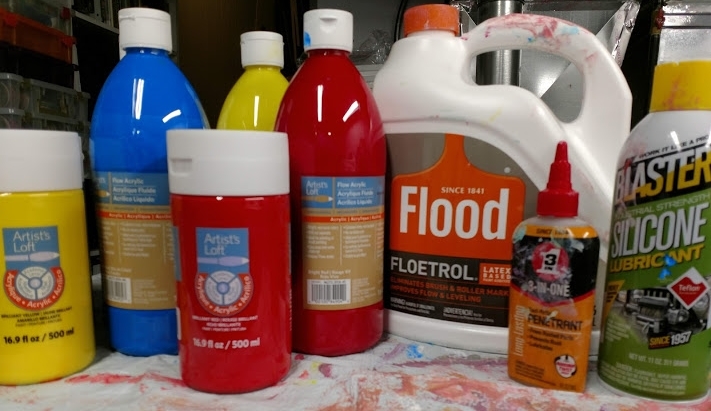 Remember – the colors are different in the photo only because the tubes have been rotated differently. All of the odd numbered loops have been cut from one tube, and all of the even numbered loops have been cut from another tube. Now it’s time to open up the loops! I like to use an inexpensive foam core board for this. Being able to look at the design vertically helps immensely. As I open each loop, I pin it to the board and transfer the number to the top of the bargello strip.